NETWORK FINALS: GOTHAM gained 0.1 in final numbers. 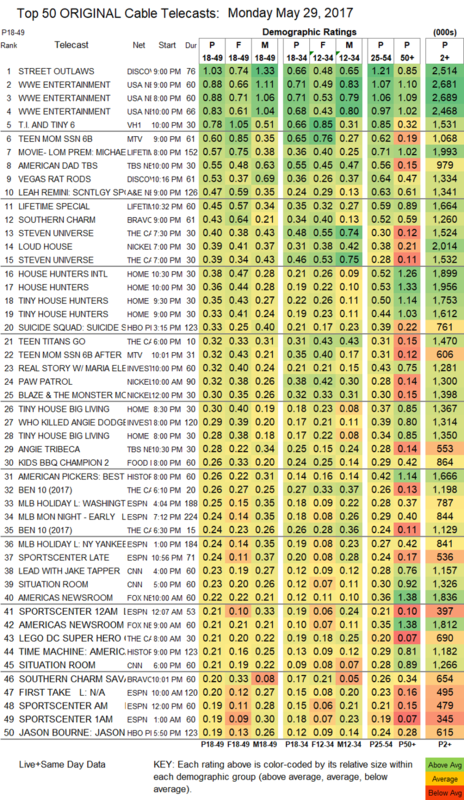 CABLE HIGHLIGHTS: Discovery took the cable lead on Memorial Day night with STREET OUTLAWS, up 0.06 to 1.03, and its lead-out VEGAS RAT RODS was up 0.04 to 0.53. USA’s WWE telecast was at 0.88/0.88/0.83, compared to last week’s 0.97/0.89/0.87. VH1 didn’t air a new LOVE & HIP-HOP, but TI & TINY was steady anyway at 0.78. On MTV, TEEN MOM rose 0.04 to 0.60, and the AFTER-SHOW was down 0.08 to 0.32. Lifetime’s original movie MICHAEL JACKSON: SEARCHING FOR NEVERLAND was at 0.57, and an AFTER-SHOW special was at 0.45, followed by an episode of PROMPOSAL at 0.17. 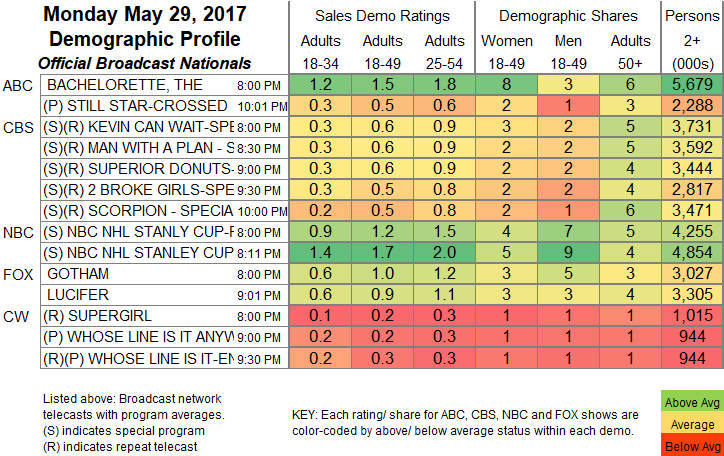 On TBS, AMERICAN DAD returned at 0.55, but despite the big lead-in, ANGIE TRIBECA only ticked up to 0.28. A&E’s LEAH REMINI SCIENTOLOGY special was at 0.47. On Bravo, SOUTHERN CHARM gained 0.04 to 0.43, and SOUTHERN CHARM SAVANNAH ticked up to 0.20. 2 episodes of Cartoon Network’s STEVEN UNIVERSE were in the Top 15 at 0.40/0.39, and Nickelodeon’s LOUD HOUSE was with them at 0.39. A quartet of HGTV shows in the Top 20 were led by HOUSE HUNTERS INTL, up 0.13 to 0.38. ID’s REAL STORY was at 0.32, and WHO KILLED ANGIE DODGE was at 0.29. Food Network’s KIDS BBQ CHAMPIONSHIP rose 0.07 to 0.26.